On Saturday afternoon on December 2nd, following a long day of work, I pedaled slowly on my bicycle down Dumaine street in Treme, headed towards Claiborne Avenue. The previous month, I had tried to make the first-ever Treme Farmer’s Market but missed it as the market was breaking down early after a long day. As I reached Ms. Gloria’s Garden and walked my bicycle into the yard, I quickly realized that my luck was the same for the second market. The garden space was mostly empty, and some folks were still in the middle of packing up. Still, I was curious to learn more about the market. Everyone was friendly and greeted me as I walked through. As I gazed around at the garden beds that were raised up to waist level and flush with vegetables, a lively older woman wearing a black hooded sweatshirt greeted me warmly. She started to mention that the market was closing down because it was getting cold out, but they would be back there again in a month. I quickly realized that it was Ms. Gloria! Ms. Gloria told me that I was welcome to come back whenever to get some vegetables that she would pick fresh straight from the garden. 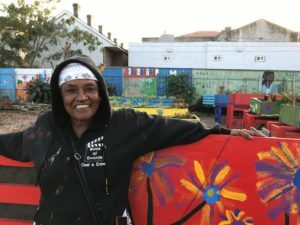 She explained that she gave away vegetables to anyone who was hungry, and pointed out the space where an herb garden would soon be for the children in the neighborhood to take care of. The second Treme Farmer’s Market had about eight vendors overall, and four of them were farmers. Ms. Gloria hopes to have more in the future after other farmers have had more time to grow additional crops for the market. 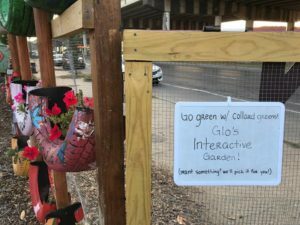 The market happens every first Saturday from 11 a.m. to around 4 p.m. in the winter at Ms. Gloria’s Garden, located at 814 N. Claiborne. I hope that I can make the next market! 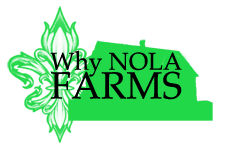 If you’re a farmer and you’re interested in participating in the market, or you’d like to volunteer, e-mail bwblouisiana@gmail.com. To donate to the garden, here is the gofundmepage: https://www.gofundme.com/gloriastremegarden.